Pretty darn cool and easy to integrate! I’ll have to try it out. 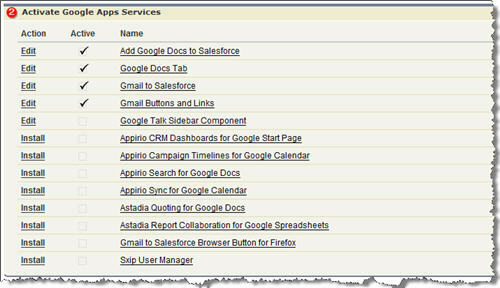 It’s strange to think of a corporation spending hundreds of thousands of dollars on a CRM solution (depending on the # of licenses) and then using a free limited functionality online office suite. However, this will be a nice boost in free storage which is something that every SFDC admin needs. I just noticed that my salesforce account doesn’t have google talk enabled but it is in the apps section. Does anyone have any ideas about that please as I am quite new to this. 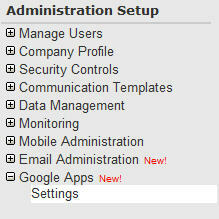 @Daemon Singer, go to the Google|Settings menu to make sure the app is enabled (sounds like you did that already). You then need to edit your Home Page Layout to add it to the sidebar. Comment back on how that worked for you.